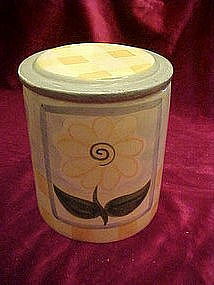 Cute ceramic cylinder cookie jar by Cookie Keepers. Made of hand painted glazed ceramic. Sunny yellow gingham with blue accents and a pretty yellow flower Great condition. Measures just 6 1/4" tall.